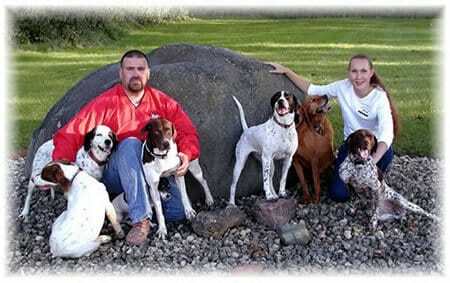 Jeremy and Amy have combined their dreams and interests to develop Any Good Reason Kennels. Jeremy’s lifelong passion for hunting has inspired him to develop the quality of hunting dog that he has always enjoyed. He benefits from a family tradition of breeding German Shorthair Pointers passed down from his grandfather to his father and now to him. Jeremy is devoted to breeding dogs that excel in and out of the field. Any Good Reason Kennel’s dogs must prove themselves in real hunting situations before they enter the breeding program. Jeremy prides himself on not only knowing his bloodlines but those of other predominant pointer breeders in effort to use the stock with the most desirable traits. Amy’s love of dogs ensures the utmost quality control. She has over 10 years of experience in veterinary medicine and specializes in behavior and nutrition. This means that Any Good Reason Kennel’s adheres to only the highest medical and ethical standards. The dogs are treated as family members with individual respect given to each dogs physical and mental needs. Amy is committed to promoting the versatility of the pointing dog group by working in other genres than hunting such as obedience, therapy, and agility. Her goal is to make sure that each member of Any Good Reason Kennel’s breeding program is an ambassador for the breed. My Lizzie is out of McKenzie's May 09 litter. You (Jeremy) were pretty optimistic about the litter, so I want let you know how Lizzie is turning out. I ran her in a North American Versatile Hunting Dog Association (NAVHDA) test a couple week ago. She did very well scoring 108 out of 112 max! She only slipped on the tracking portion and for that I can excuse her.. It was very short stubble and I had not had a chance to let her practice that in advance.